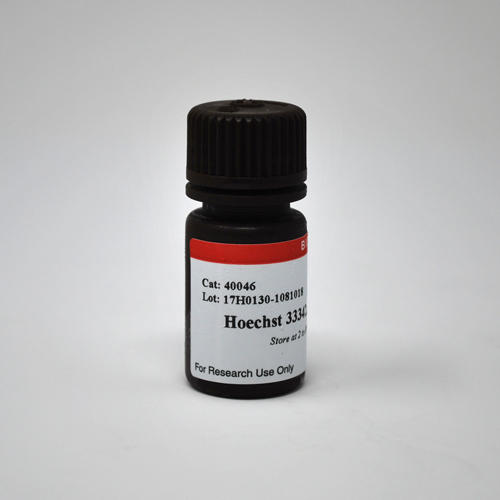 For ease of use and safer handling, we offer both Hoechst 33258 and Hoechst 33342 dissolved in H2O at 10 mg/mL. Hoechst dyes are cell membrane-permeant, minor groove-binding blue fluorescent DNA stains. For ease of use and safer handling, we offer both Hoechst 33258 and Hoechst 33342 dissolved in H2O at 10 mg/mL. Hoechst dyes are cell membrane-permeant, minor groove-binding blue fluorescent DNA stains. 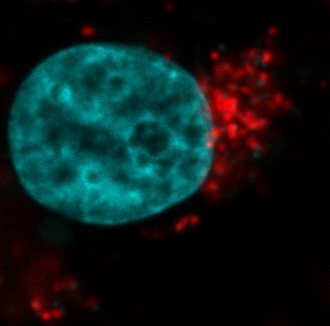 Hoechst dyes are widely used in cell cycle and apoptosis studies and also as nuclear counterstains. Hoechst 33342 is reported to be slightly more membrane-permeable than Hoechst 33258, but either dye can be used to stain live or fixed cell in buffer or medium at 1 ug/mL, with no wash step required.